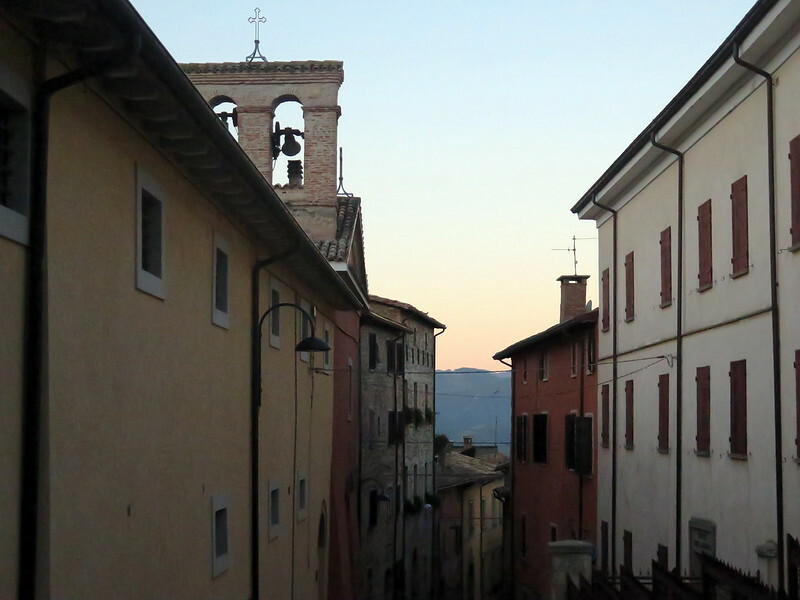 Though the dorm room of the convent is frigid, our excitement for the festival pulls me from my bed and carries me out to Sant’Agata Feltria’s cobbled streets. 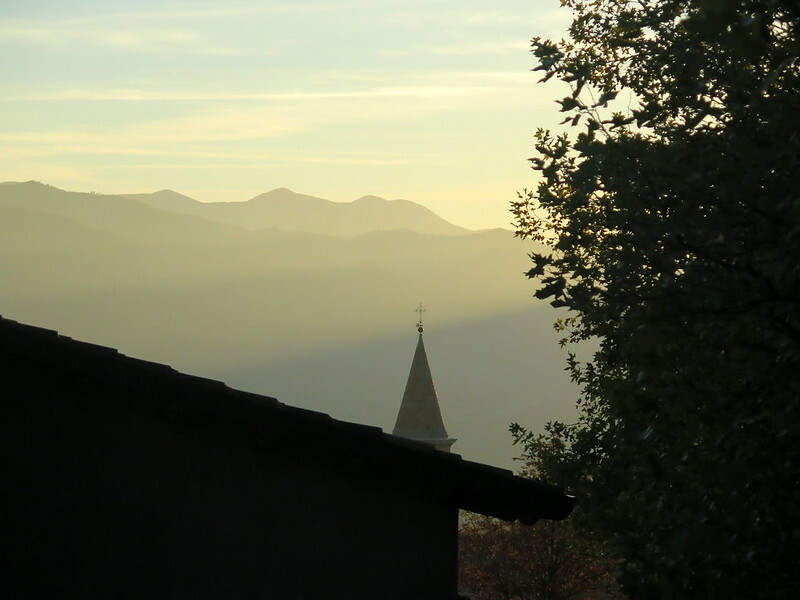 The city is bathed in dawn light and the bells of a church ring out across the rooftops. I can feel the sound reverberate in the air and as we follow the cobblestones street down to the festival tents on the central square. 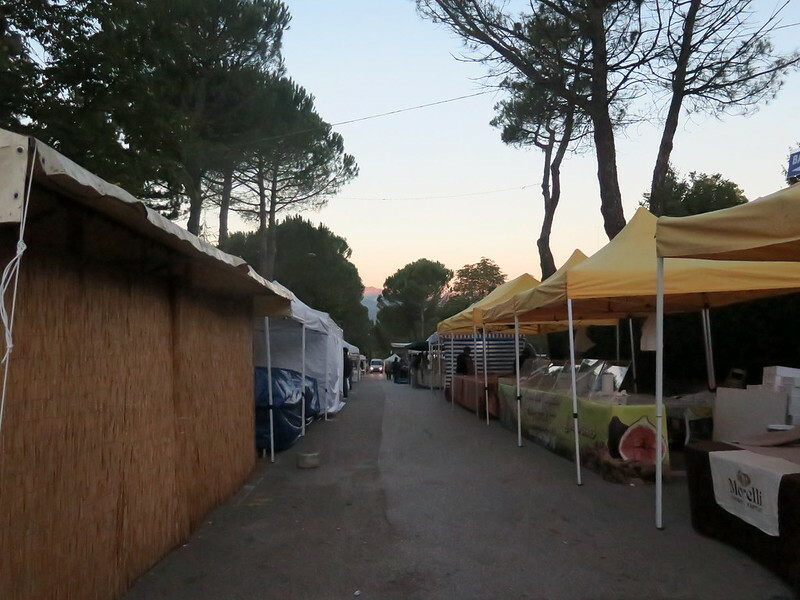 Shopkeepers and festival vendors are preparing their stalls and wares for the day by the first light of the sky and fluorescent lamps. 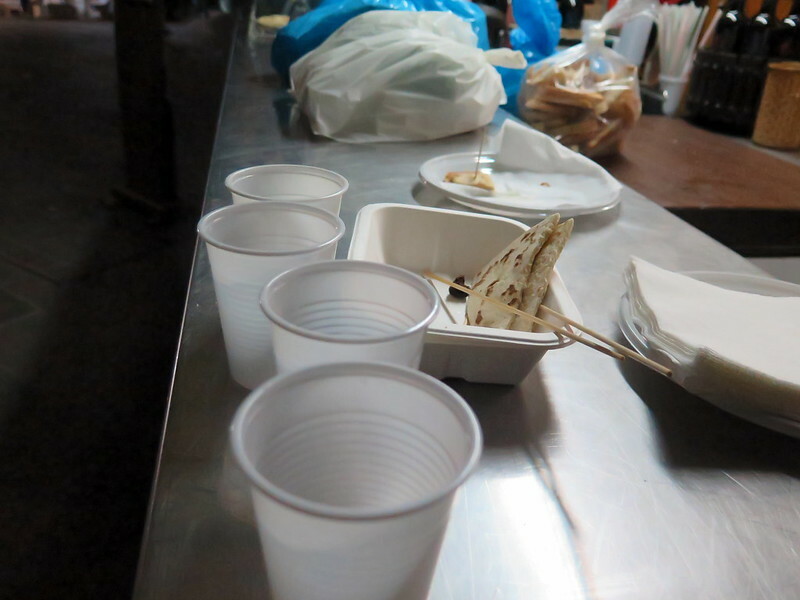 They unload boxes, bags, and cartons from tall white vans, carrying their wares to covered stalls, arranging goods and preparing food for the coming crowds. The local café is open early, and between preparations vendors savor a morning espresso. Even with all the work to be done, most prefer to stop for a few minutes and drink at the café counter instead of taking a to-go cup. Even after coffee and a croissant, Stoytcho and I are hungry for breakfast and find ourselves gravitating toward rich smells emanating from food stalls at the square’s edge. 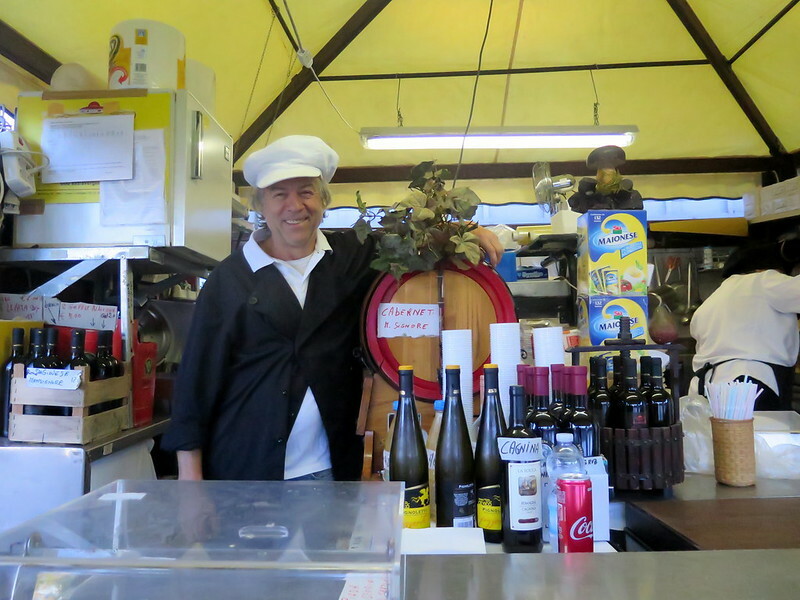 People are busily chopping, cooking, preparing, but one couple is willing to take an order of fried porcini at the price of 8 euros. They come out in golden breaded strips, fresh from the deep fryer, and taste simultaneously buttery, nutty, and savory. As we’re munch away, one of the hosts passes us a cup of wine with a wink. This one’s on the house. Full, slightly tipsy, and lulled into somnolence by the quiet morning, we return to the convent for a nap. 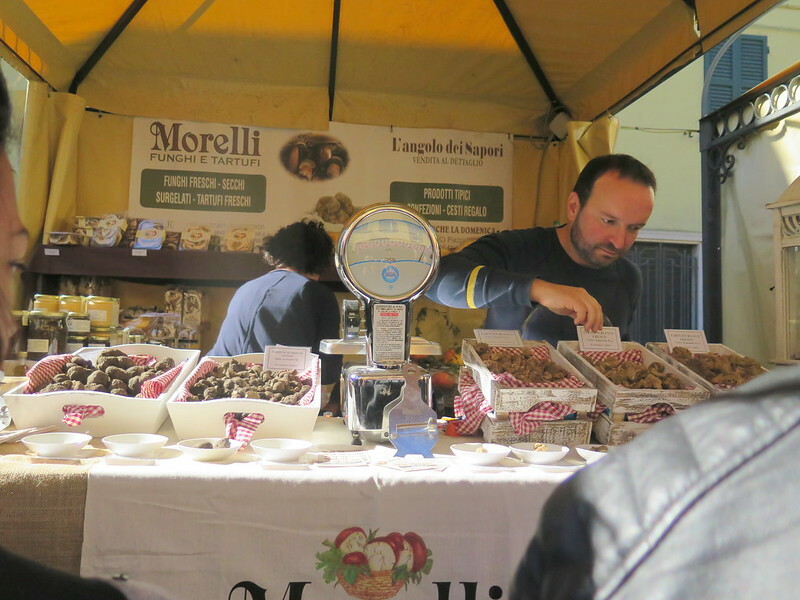 When we return to the truffle festival after our morning siesta, the town center is thronging with dense crowds, browsing shop and stall for local wares, fall produce, and of course, all things truffle. 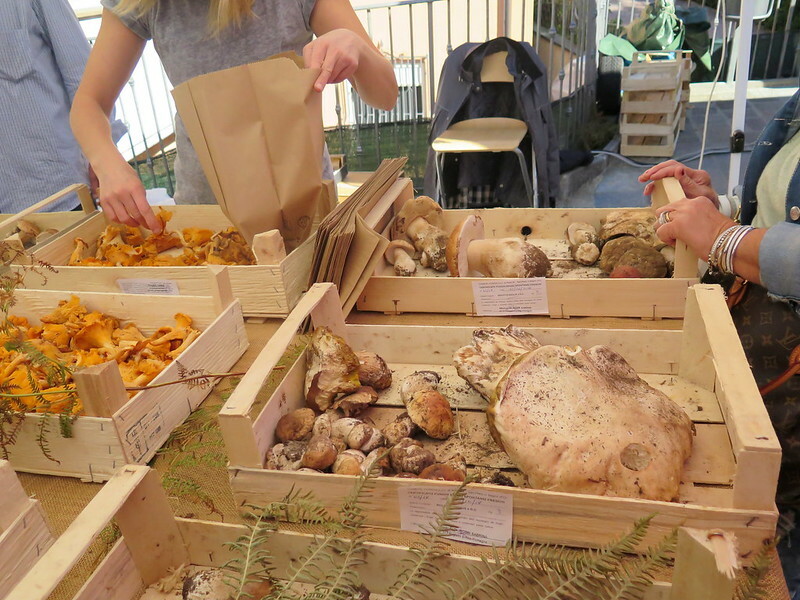 The first business is truffles, and stalls proudly display baskets full of black and white truffles for the eyes of discerning buyers who peer and sniff and gently prod to pick the choicest specimens. 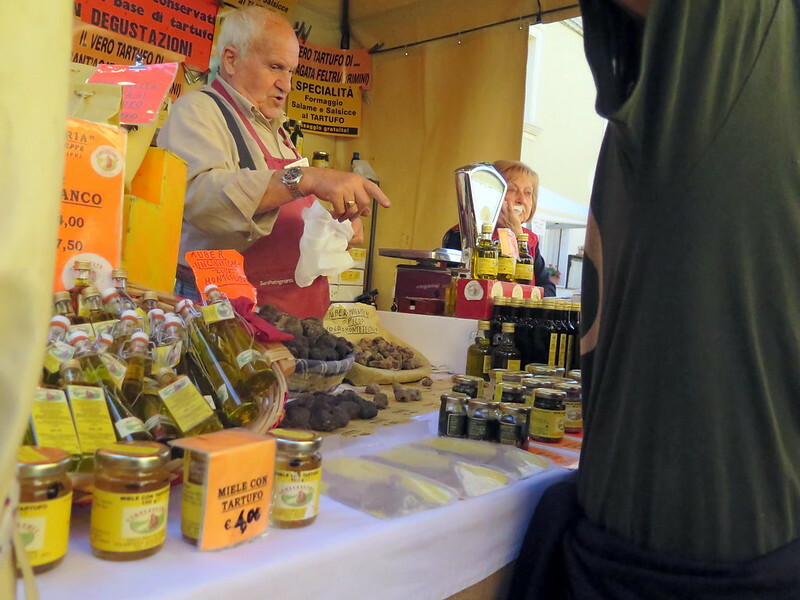 While I would love to buy some, we’re here for only an evening longer and there’s little in the way I could prepare, so my interest is the second business of the fair: truffle products, from spreads to premade sauces to salts and honeys. And every vendor has a few jars open with crackers nearby so you can sample. It’s hard to resist buying everything. 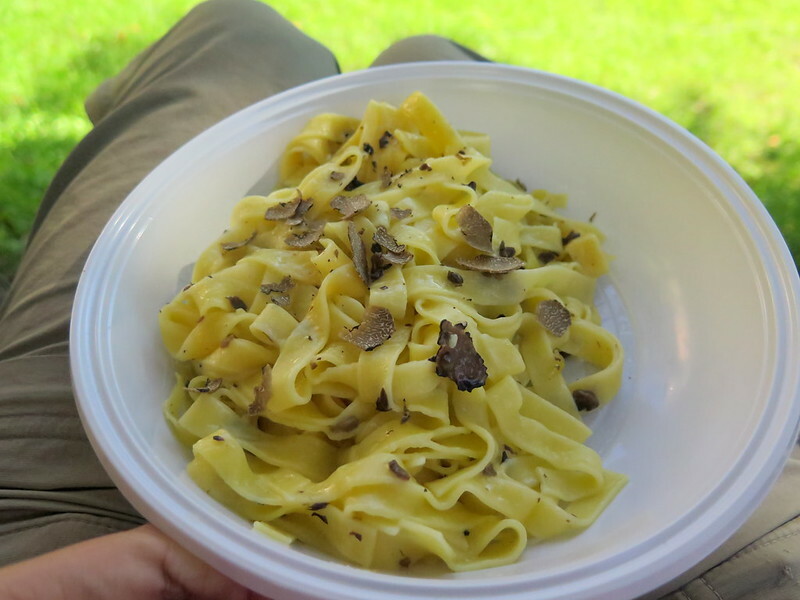 We try to get lunch at the food stall we ate breakfast from, but the sea of people already ordering from them is impassable, so we opt for truffle pasta at a vendor further from the main square. While it’s truffle-flavored, it’s not as rich as it could be, but still satisfying. 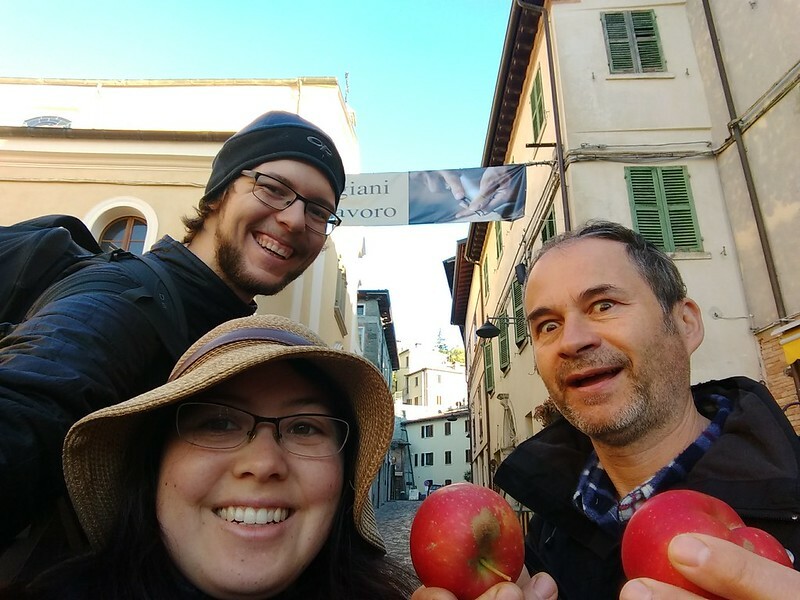 The highlight is the pasta’s soft texture, worlds away from the feel of boiled boxed pasta in the U.S. We sit in the shade of a tree and eat slowly. 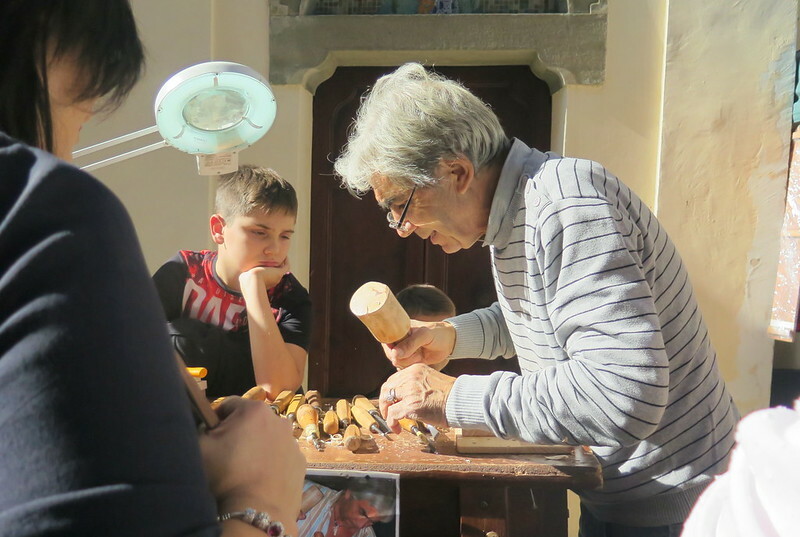 The festival also offers a cornucopia of other local foods, from fresh fall chanterelles and porcinis to locally produced sausage, cheeses, and olives to fresh baked sweets. 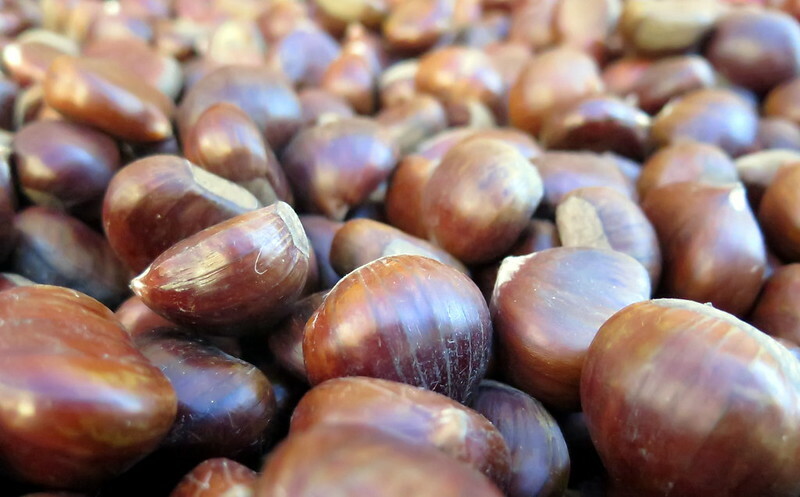 We buy a bag of marrones, sweet chestnuts that are freshly roasted in a steel pan. 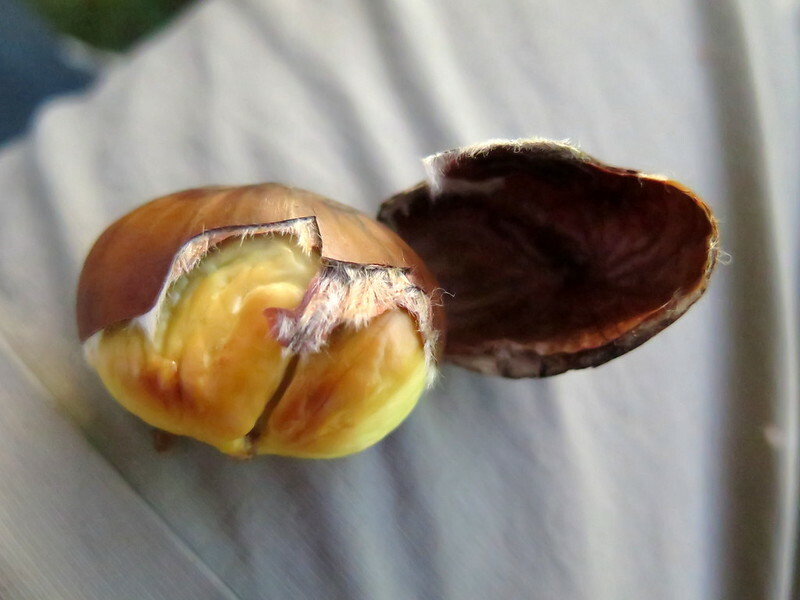 They taste like maple syrup, with the texture that reminds me of marzipan. Before the day is done, we’ll buy a second bag. But for now, once again full and sleepy, we return to the convent with our purchased truffle products to ship back home. We wake again in the late afternoon to take one last foray out to the festival. The crowds have mostly dispersed and the cobblestone streets are once again navigable paths. 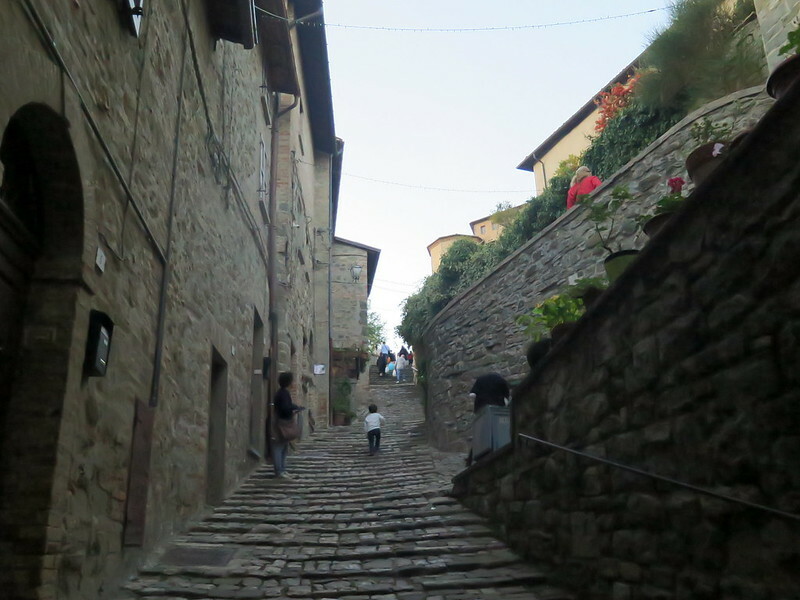 We follow a small crowd of people up a path we have not yet explored, up wide stone stairs and through archways to a vista overlooking the town. 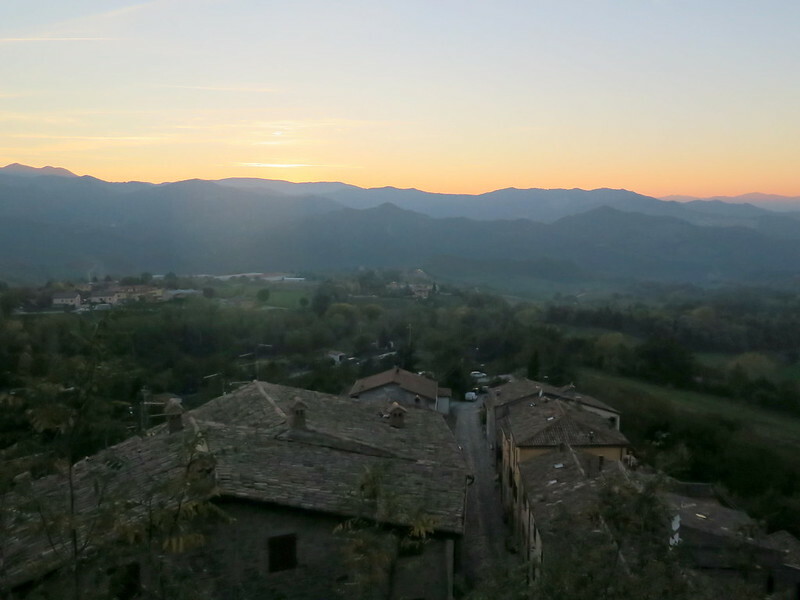 The sun sinks behind the hills and orange hues fade to reds, purples, and blues. The church bells ring once more. Though most truffle vendors have closed their stalls and left for home, others still sell food and snacks by fluorescent lamplight. 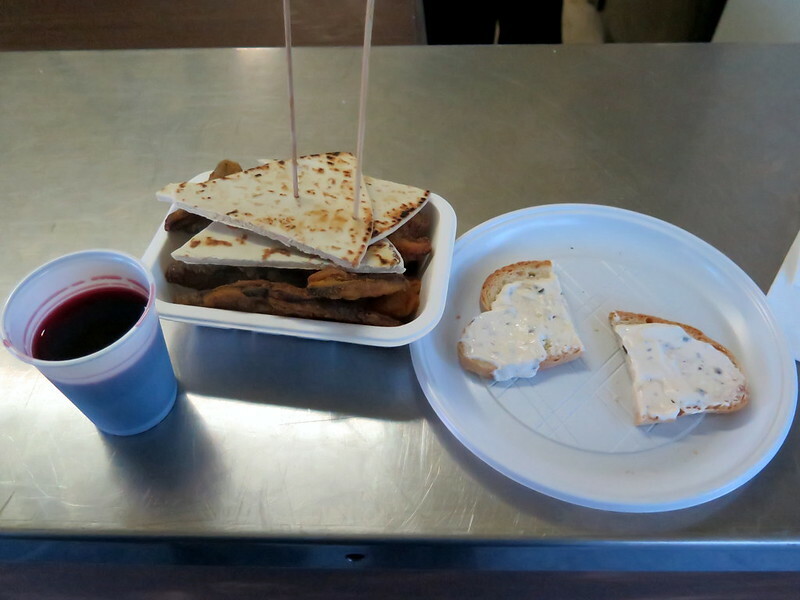 We buy a second batch of marrones and two sausages – one for ourselves and one for the Father of the convent – and walk slowly through the central square. 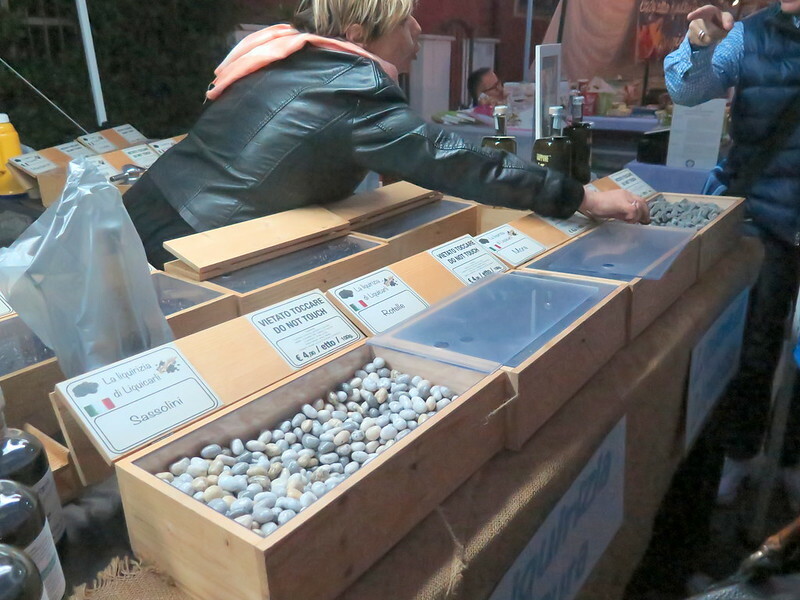 In one corner we find a woman selling sweet, medicinal-smelling candies. It’s artisanal licorice, because of course Italy has artisanal licorice. Why wouldn’t they? For dinner we return to the food stall where we ate fried porcini for breakfast. We find the same couple still working in the stall’s kitchen, now with a few extra women as help, filling the occasional orders from townsfolk and tourists who have stuck around. We ask for another batch of fried porcini and they recognize us, and before long we get another batch of fresh-fried mushrooms and a couple of glasses of wine. We use Google Translate to tell them that their food was the best, and the man grins brightly. He motions one of the women over to us, who turns out to be his niece who speaks English, and we carry on a conversation. We share how long we’ve been traveling and where we’ve been and what we’ve seen. 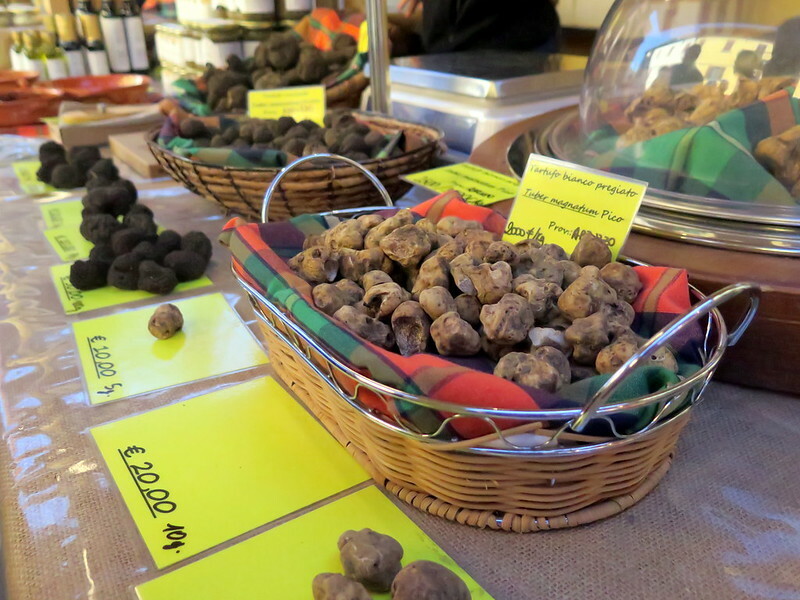 They tell us about cooking at the truffle fair as a family. During the rest of the year, the hold separate jobs in government or teaching, but each year for this festival the family reunites to prepare and cook and celebrate mushrooms. I’m amazed to discover food so good isn’t from a professional chef. A generous chap who speaks English (and Russian!) and runs the local produce store insisted on giving us a beer to take home that night, on the house. When we saw him in the morning, he also insisted on giving us apples to take on the bus for breakfast.